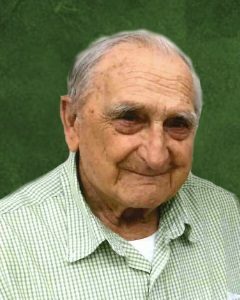 Dwaine D. Raddatz, age 89, of rural Hutchinson, passed away Wednesday, July 11th, 2018, at his home in Hutchinson. Memorial Services will be held Monday, July 23, 2018, 11:00 A.M., at Peace Lutheran Church in Hutchinson. A gathering of family and friends will be held Monday, July 23, 2018, from 10:00 – 11:00 A.M., one hour prior to the service ALL AT THE CHURCH. Dwaine Delbert Raddatz, son of Alfred and Bertha (Ott) Raddatz was born October 4, 1928 in Redwood Falls Township, Minnesota. He was baptized and confirmed at St. John's Lutheran Church in Redwood Falls. Dwaine received his education at the county school in Redwood Township. He was an excellent student with an exceptional gift for math, but his circumstances prevented him from further pursuing this gift. Dwaine's father passed away when he was a very young child. Throughout his school years Dwaine shouldered most of the responsibilities of caring for the family farm and his mother. Dwaine farmed and did custom baling and field work for neighbors throughout the Redwood area. He was also a valued employee for Donald Poynter. Dwaine's love of music and singing led him to perform in a local popular band for years, playing country, polkas and standards. There have been many family stories about the “Raddatz” cousins, who all had an exceptional sense of humor, which inspired a lot of hilarious stories that revolved around the old-time dances that they attended regularly. He also loved playing softball, catching for the Redwood Royals. In later years he coached several women’s softball teams in the metro and Hutchinson areas. Dwaine met Angie Sluss in 1956, and the two were married in October of 1958. They spent several years in Redwood Falls working, singing, and playing music. Dwaine and Angie sang beautiful harmony together. Their personalities were a fun match and they had a great stage presence. They had years of fun playing music and entertaining with their talented group of musician friends in the Redwood and metro areas. Dwaine took a job as a truck driver for Plehal Blacktopping in the Twin Cities then moved to a career in tool machining and fabrication. He worked at Whirl Air Flow and then at Theile Engineering, installing and repairing packaging equipment and traveled extensively for the company. He worked for Theile Engineering for nearly 35 years. He has his name, along with a co-worker, on a U.S. patent for Thiele Engineering that the two of them invented. In 1970 Dwaine and Angie adopted twin boys, Joel and Paul. The Raddatz family moved to Hutchinson in 1972 and Dwaine commuted to the metro area for many years. Throughout Dwaine's life, making music, telling stories, nurturing the land, animals and his family brought him great joy. He was an excellent grandfather and was very proud of his granddaughters. He enjoyed their recitals, sporting events, and especially their company. He worked hard and never complained. He loved breakfast throughout the day and a good gas economy car. He loved to watch sports and to laugh at his own jokes. Dwaine was a spiritual man and we are comforted that he has gone home to walk with Christ. Dwaine passed away at "The Farm" on July 11, 2018, peacefully surrounded by his family. Also, many nieces, nephews, relatives and friends. Dwaine is preceded in death by his: parents Alfred and Bertha; sisters Verna, Ethel, Lois, and Bernice; and brother, Lester. What a beautifully written obituary. Our deepest sympathies to the Raddatz families on the death of your husband, dad and grandpa. Your memories will live forever. Our deepest sympathies to dear Angie, Joel and wife, Paul and wife, and 4 precious Granddaughters. During this difficult time,may your heart find hope in that God sees and cares — and so do we. He is always with you. You are in our prayers.